Kobelco Mini Excavators are known to be compact, reliable and powerful and have been boasted by customers from all over Australia. Many businesses count on our excavators to deliver top-class performance along with strong support from our dealer network to provide great after-sales support and service so they can focus on what matters - keeping their clients happy. 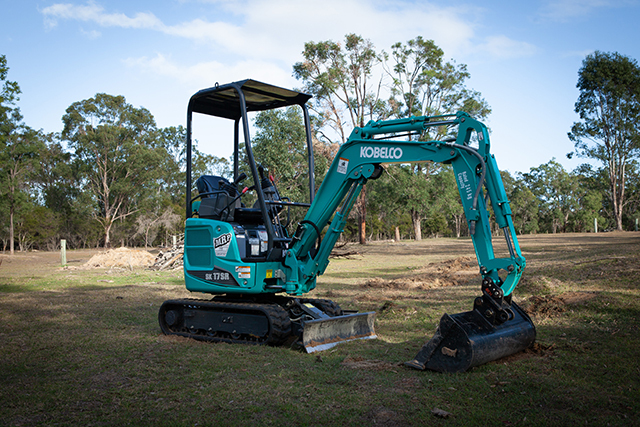 The full Kobelco range of excavators comes with the best warranty in the market. In particular, our mini excavator range comes with Standard 4 Year / 4,000 Hour Full Warranty. If you are interested in a mini excavator, we are currently offering 0.99% with No Deposit over 36 months on these Kobelco mini excavator models - SK008, SK12SR and SK17SR. Offer ends 30/10/18, and is only valid for Australian businesses. Terms and conditions, lending criteria apply. Fill out the form and we will pass this on to your nearest Kobelco Dealer to provide you with the best priced package on this finance offer. Your local Kobelco Dealer will be able to tell provide you with a quote on the attachments you require as well as trailer if required. "Kobelco mini's are great for tight access jobs and strong enough to get the job done," Nevano Cowan. "My last Kobelco SK17, got over 2000 hours with no issues (other than an idler covered on warranty) and still got great resale / trade in on it," Tyler Page. "We purchased the sk17sr and couldn’t be happier . After trialling a few different brands we decided to go with the Kobelco. It’s by far a superior machine on all levels compared to other brands . We will be sure go with Kobelco for our next purchase," Ben Carmody.